We've always had a penchant for (read: obsession with) bird jewellery and it's always featured heavily on our website (see: Bird is the Word collection). So, when we saw our favourite feathered variety - owls - were having a bit of a moment on the catwalk (thank you, Burberry) for A/W 2012, well we were *elated*. 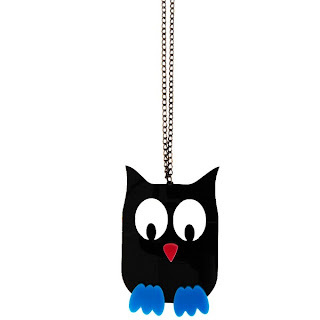 This Oversized Acrylic Owl Pendant, £12, is probably our most kitsch piece of the collection. With its statement, acrylic good looks this necklace is the ultimate in quirky jewellery. 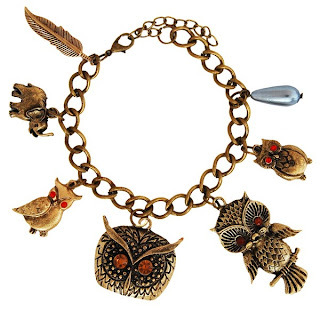 Our Owl Charm Bracelet, £10, is a little more sophisticated with its antique gold and crystal multi-charms - it could easily become our go-to piece this season! 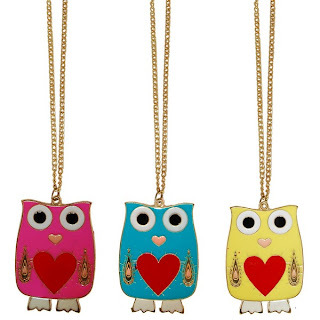 Another bright necklace offering, this time in the form of our enamel Owl Heart Necklace, £8, available in pink, blue or yellow (or like some of our customers - one in each colour). We got funky covered!